Japan is a country where it is difficult for a married person to be feminist. A civil marriage is bound up with various inequalities: for example; the spouses have to assume the same surname, have a mutual commitment to marital fidelity, and agree to a ban on remarriage. The reasons to marry are very individual, but the foggy field between marriage and the associated inequalities is a strain for many people. Hello, I'm Mai Endo. I work as an actress and artist. I’m one of those who decided to marry. As an ironic comment on myself, we performed our wedding ceremony at the Goethe-Institut Tokyo under the title I Am Not a Feminist. It was also part of the Festival / Tokyo 17 programme. The ceremony took place before relatives, friends and the general public. We signed a self-composed marriage contract in front of these people. It is enshrined in the Civil Code of Japan that a married couple must have the same surname (except for international marriages where double names are allowed: Article 750 of the Civil Code). More than 90 per cent of women change their surname. In addition, the married couple is obliged to live together (Article 752 of the Civil Code) and the mention of “infidelity as a reason for divorce” (Article 770) indicates the married couple’s obligation to mutual fidelity. Moreover, after divorce, women must observe a 100-day period before being allowed to enter into a new marriage (to exclude prior pregnancy / paternity: Article 733 of the Civil Code). These regulations can be traced back to remnants of the Confucian family system, the so-called “IE system”, which gradually replaced the formerly matriarchal social structure in Japan in the fifth century and became more and more institutionalized. To this day, new patriarchal concepts are regularly devised to find plausible grounds for this long-obsolete system. By the way, I have a quail. The quail is said to be the only animal successfully domesticated in Japan. It is kept both as a farm animal and a pet, and is a common motif in ancient Japanese paintings. I too have used it as a motif and made a music video called Quail Rap. It isn’t easy to keep a quail in a flat, because it does its business everywhere. It never thinks about going to the loo before having a walk around the flat, so you can only wipe everything up afterwards. It’s worst when it goes on the blankets! It flits amongst the furniture, so it’s hard to keep an eye on it. When I relax lying on a pillow, something sometimes sticks to me without me noticing it, something from behind. I think my inattention may someday put me in my grave! As a result of poultry farming, the number of eggs laid by quails has increased massively and their instinct to hatch eggs disappeared. Without human help, breeding is therefore impossible. 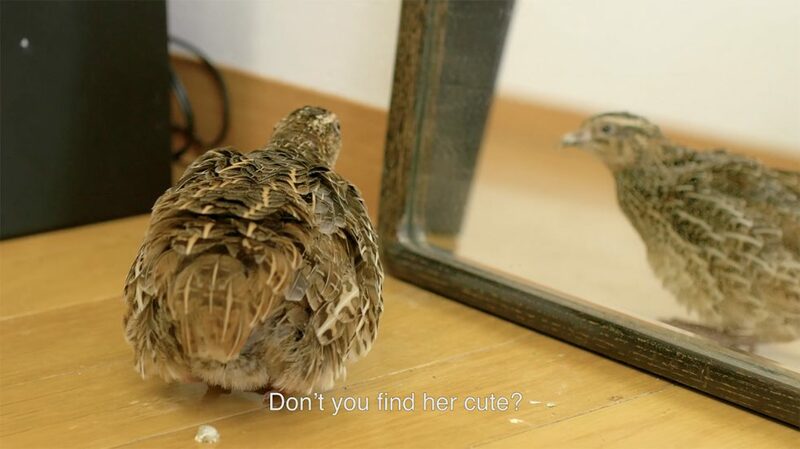 Suppose we release the quails from human custody: would there be a place where they could be themselves? Well, if, for instance, we threw our quail out of the house and left them to themselves, they would most likely at once become prey for cats. It’s worrying to observe that these animals, with the exception of naturally wild quail, cannot survive on their own. The idea of “liberating yourself so as to be how you are” is purely human. The expression implies liberation from a restrictive situation. People can shout it out, defy the system with an iron will, build a DIY castle and assert their position. For a quail, on the other hand, the choice of freedom means certain death. The quail lacks the means to reject the system. From the corrugated containerboard to the house, it was always its fate to end on the plate and today its life is subject to my mood. Whether it accepts or rejects its environment, it lives from one day to the next. I would be happy to be like the quail, which accepts its fate so calmly. I want to live like a quail! But I have a choice in life. Although the quail is sitting next to me, I live in a completely different world from it. I am free to choose what I like and the environment in which I live. Yet even so, my choice is limited by social norms. What I can and cannot choose are basically two sides of the same coin. That is to say, the possibilities of unlimited choice are limited by realistic constraints. With every choice, society demands personal responsibility. The more unusual or smaller the minority in which my choice places me, the greater my responsibility will be. The video installation was projected with English subtitles above the marriage bed of the couple. Even old traditions, such as that the woman moves into her husband's house, were offset by modern agreements. Is marriage connected with the task of achieving your own freedom? And if so, can this freedom be preserved through a self-composed marriage contract? In the case of couples, we distinguish legally only between unmarried, married and registered partnerships. 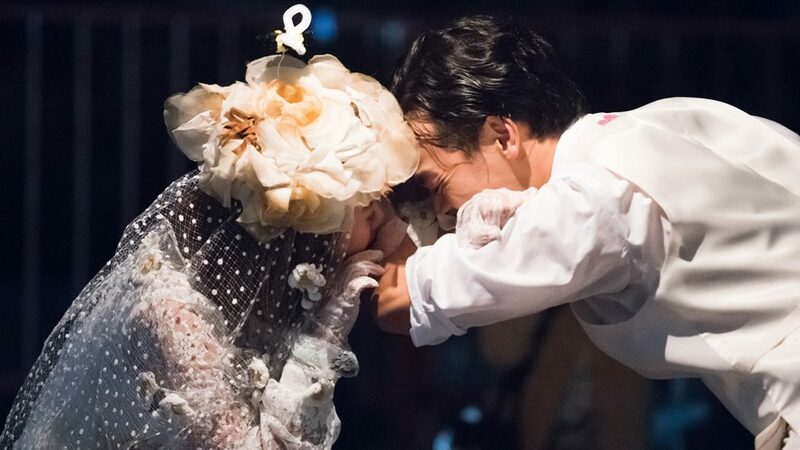 The majority of Japanese couples choose marriage. If you decide to marry, you end up in the unequal system described above. Germans have pointed out to me that, for them, feminism and marriage are unrelated, so we have to see this primarily as a Japanese problem. The inequality associated with marriage is anchored not only in a system, but also in a major problem in social norms. Japanese society requires obedience, chastity and docility from women. 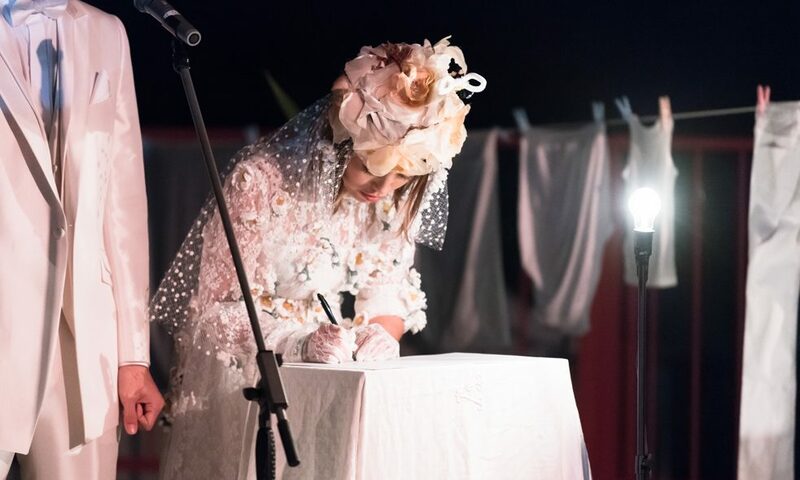 In I Am Not a Feminist we tried to show, in the form of a marriage contract, alternative ways of marriage that do not fit into the categories “unmarried, married and registered partnership”. As there are many categories depending on the particular feminist position, it is logical that there should also be different types of marriage. Still, problems also occur here. Article 754 of the Civil Code provides that marital contracts may be terminated at any time by one of the two partners. In order to conclude a legally binding contract between two persons, they may not therefore be married to one other when concluding the contract. For our new marriage contract to be legally effective, it was thus first necessary to dissolve our existing marriage. That's why we divorced before our wedding at the Goethe-Institut Tokyo – so that our alternative marriage contract would be legally binding. The new contract period is three years. This period is extended by one year after each renewal. Before each renewal, we will divorce once again and have our marriage relationship re-registered. In addition, we have decided to change our last name after each contract when we issue the marriage banns. Since up to now we have taken the surname of my husband, in the new contract we will switch to my family name, Endo, for the next three years. With regard to the obligation of marital fidelity, we have agreed that, as far as our relationship is not contrary to public order and morality, we will eliminate the inconveniences of marriage and refrain from exacting punishment for infidelity. Or quite concretely, that a partner, after a proven adultery, for example, is freed from the payment of compensation. Moreover, we have set down in the contract that our common possessions, the artworks that we produce, should go to benefit the general public. In this way, we want to open our marital partnership to society. The family name a couple chooses, whether it wants to live together and how it deals with adultery - the various issues that a marriage entails shouldn’t be decided according to traditional laws, but rather according to the autonomous ethical standards of the couple. As husband and wife, we have chosen a playful approach to the marriage system. A “role reversal” through the change of family name, a “ventilation shaft” in monogamy, the distribution of our common property – we have simply derived the rules from our moral beliefs and tried to turn our future married life into a playground. This is another way to improve the existing system, by extending rights and balancing out inequalities. We’ve made the system the theme of our game not to “live it up” but to point up other ways of life, because, unlike quail, we can change our circumstances. Mai Endo is a freelance artist / actress and has remained a feminist in spite of her marriage.